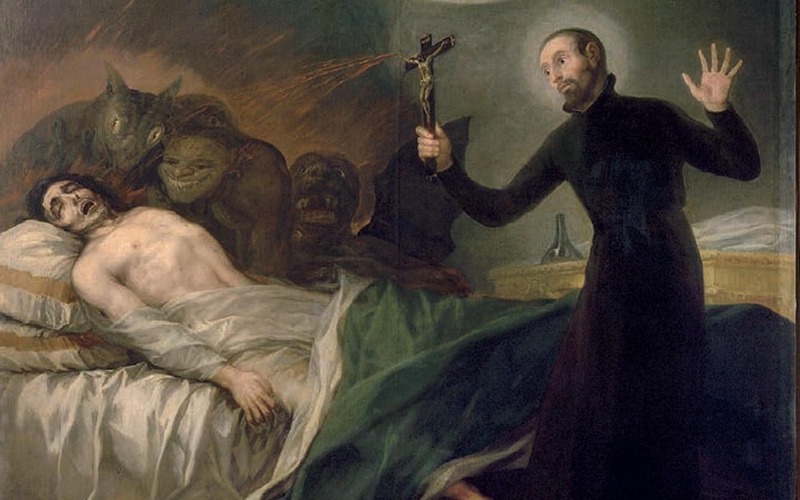 It is a phenomenon that is on the rise throughout the world: The number of cases of demonic possession – and demands for priests to carry out exorcisms – is, according to multiple sources, soaring. Medical science remains sceptical. However, a Princeton-and-Yale-educated mainstream psychiatrist believes demonic possession is indeed very real – and claims that the majority of Americans agree with him. With 25 years experience in a private psychiatric practice and as a professor at New York Medical College and Columbia University, Dr Richard Gallagher has a rare vantage point to observe human behavior. And then there is the inhuman. He is also a sought-after psychiatrist for discernment, the initial step in determining the need for exorcism. Dr Gallagher has evaluated hundreds of cases of possible possession and, in a wide-ranging and rare interview with the Telegraph, explains why he believes the phenomenon is genuine. In April, at a Vatican training course for exorcist priests, participants were told that demand for exorcism is booming as a result of a decline in Christian faith and the internet providing easy access to black magic, the occult and Satanism. Pope Francis has repeatedly reminded his followers that Satan is “a real being, roaming the Earth to devour souls like a lion”. In April, he wrote: “Hence, we should not think of the Devil as a myth, a representation, a symbol, a figure of speech or an idea. This mistake would lead us to let down our guard, to grow careless and end up more vulnerable.” He observed that life can be “a constant struggle against the devil, the prince of evil”. In the US, the number of priest exorcists has increased from twelve to fifty over the past decade. While demand for exorcism continues to surge, Dr Gallagher’s medical assessment of whether a person is mentally ill or possessed by demons will determine whether some exorcisms are conducted. He is not the only American psychiatrist who evaluates for possession – there are many others who consult on discernment. But Dr Gallagher is one of the few who is willing to talk about it. He has also written a forthcoming book on the subject, being published by Harper Collins, called Demonic Foes, A Psychiatrist Investigates Demonic Possession in the Modern United States. Of the cases referred to him for possible possession, he noted that they are people who “suffer tremendously”. “There is very strict criteria for determining the person’s problem. I am not just intuiting. I’m dealing with it from a very scientific point of view,” he said. Speaking to the Telegraph at his office in Westchester County New York, Dr Gallagher said that while possession is very rare, in his medical opinion, it is real. “There are cases of spirit possession in pretty much every culture,” he said. He has evaluated cases referred to him by priests, rabbis, Christian ministers and representatives of other spiritual traditions. Dr Gallagher does not view himself as being outside the American mainstream in his beliefs about the existence of demons. Noting that the United States is a more religious country “than somewhat secular countries in Europe”, he cited poll numbers indicating that about 70 to 75 per cent of Americans believe in the Devil and at least half of those believe that demons have the ability to affect human beings, possessed or otherwise. At one time, Dr Gallagher, a board certified psychiatrist with a primary focus on individual psychotherapy and psycho pharmacology, was also doubtful. Although a practicing Catholic, he had never volunteered to evaluate people for possession. But early in his medical career two prominent exorcists, one of whom helped found the International Association of Exorcists, referred cases to him that were so dramatic, he concluded that possession exists. One such flamboyant and dramatic case was that of “Julia”. Julia gave Dr Gallagher permission to write about her on the condition that her name and other identifying information such as where she lived in the US be changed. Other than those details, he said he took no literary license in telling her story. A direct worshipper of Satan and a self-described high priestess of a cult, Julia’s demonic possession was not in question. The core concern for the exorcism team was whether she could leave the cult so that the exorcism would succeed in liberating her from possession. On another occasion, Julia demonstrated her ability at remote viewing. She told Dr Gallagher “we really hate Father ——-”, referring to a priest on the exorcism team. She explained that it was her job to “keep an eye on him” although she lived in a different part of the United States. Whereupon she described the priest at that moment “walking along a beach in his blue windbreaker and khaki pants and he’s saying prayers”. Dr Gallagher promptly called the priest on his mobile phone and confirmed everything that Julia had described. The priest noted that normally he would be in his rectory at that time but on that particular day had decided to say his breviary while walking on the beach. Julia feared for her life in the Satanic cult and also worried that the cult leader was falling out of love with her because she was aging. And just as a “crazy” person might fear being labelled “possessed”, Julia feared being labelled “crazy” and being admitted to a mental hospital. But her exorcism, consisting of multiple attempts, ultimately failed because she could not leave the cult and continued to worship Satan. About a year after the last failed attempt at liberation, Julia called one of the team priests and said she wanted to resume the exorcisms because she had cancer and did not want to die demonically possessed. The priest, described by Dr Gallagher as “a very kindly man”, told her that he wanted Dr Gallagher to evaluate her again. Although he believes that Julia always told him the truth, Dr Gallagher requested permission to review medical records from her oncologist. Julia told him that she had to “think about it”. He and the priest never heard from her again and presume that she died. Two of the most popular books published to date on demonic possession are Glimpses of the Devil by Scott Peck and Hostage to the Devil by Malachi Martin. Both authors are deceased. Dr Gallagher describes his book as “a much broader treatment of the subject of possession”. He goes into the history of the concept, how to discern and which cases cause confusion, and describes people who may think they are possessed but are not. Such people could be suffering from seizure disorders or other neurological disorders such as temporal lobe epilepsy. People hearing the devil’s voice might be psychotic and having auditory hallucinations. Others suffering from delusions that they are possessed might be bipolar, schizophrenic, or have drug-related conditions. Dr Gallagher noted that borderline or anti-social people can have an internal battle of evil warring with a sense of decency. People who are suggestible and the histrionic may have the misconception that there is a demonic presence around them and/or that they are being manipulated by other people into believing that. Those with multiple personality disorders might have an evil alter ego that can be misinterpreted as demonic by “overly credulous or fundamentalist people”, according to Dr Gallagher. Demonic Foes profiles dramatic possession cases discerned by Dr Gallagher who gave their permission for their stories to be told. Julia is one. The discernment process requires a broad spectrum of information. Dr Gallagher not only examines and interviews the victim but also speaks to the clergy involved and the victim’s family. A challenge of discernment is gathering enough information. If Dr Gallagher has enough history and information he says he can make a determination in one meeting with the victim. Sometimes it takes several meetings. Dr Gallagher will want to know if the victim turned to evil, was heavily involved in the occult, or was a Satanist, which he believes is a rare phenomenon. He noted that this kind of history is typical of people who are possessed. There are other specific criteria used to evaluate for possession: the ability to speak in other languages, abnormal strength, paranormal ability, and the knowledge of secret things. What all those criteria have in common, he said, is that they are indicative of another entity being in possession of the person. Dr Gallagher has heard demonic voices come out of possessed people when they are in trance-like states, which they go in and out of. When they come out of the trance they are more or less themselves but do not remember what happened. Over time, people have offered inadequate explanations for the manifestation of possession criteria, Dr Gallagher said. For example, a theory is espoused that knowledge of hidden things really just amounts to a cold reading, which law enforcement officers can be trained to do by observing facial expressions. But the hidden knowledge of someone who is possessed is true esoteric knowledge. Julia, for example, accurately told Dr Gallagher how his mother had died. Dr Gallagher has directly observed 100 full blown possessions over the past twenty-five years. He has attended a few hundred other exorcisms as an observer, none of whom were his patients. He only attends exorcisms where the team “knows what they’re doing”. And that includes proper restraint of the victim to prevent that person from trying to run away or attack the exorcist. In the United States, the victim must sign a legal form indicating they have agreed to the ritual. According to Dr Gallagher, when the demonic is accessed, the demon is in control and “would do all sort of things if not restrained”. Attending an exorcism, Dr Gallagher says, is “spooky and creepy”. He draws a comparison to his experiences interviewing terrorists and criminals committed to an evil life. Describing himself as “pretty devout”, Dr Gallagher says he has people praying for him when he attends an exorcism and is not afraid because he believes he’s on the winning side. He has heard victims speak in different languages, noting that demons know all languages. When priests are conducting the Rite in Latin, victims are clearly following along, Dr Gallagher said, and will often comment in English. An entity with a “nasty attacking personality” with one or more of the other criteria for possession is demonic. He said he had seen all those traits on one or more occasions. Dr Gallagher believes that demons have been observing human beings since the beginning of time. “They’re very, very smart. The intelligence level of a fallen angel, which is what I call them, is far superior to human beings. Which is why they denigrate human beings. They sometimes call us ‘monkeys’,” he said. Eight people, including two nuns and two priests, told Dr Gallagher that Julia levitated during one of her exorcisms and he believes them although he was not an eyewitness. But he would not believe film or videotape showing levitation. “Demons are intelligent, malevolent, manipulative creatures. They aren’t going to perform for a camera. They know they’re being taped,” he said. He does not believe in group exorcisms, which he says can potentially harm the merely mentally ill, preventing them from getting the medical help they need. For the truly possessed, he said, the ritual must be done privately not publicly. And he is opposed to anyone who charges for an exorcism as it goes against biblical teaching. Dr Gallagher made it clear that he has discerned possession only in cases where it was already suspected. “The clergy of many different faiths who have sent people to me sense that something is happening that is of the world beyond.” These victims, he said, should not be left to suffer because of the scepticism of conventional medical opinion.